Well, here we are, a new year of programs led by our new Bush, Louisiana Program Director, Ronnie Alpha. 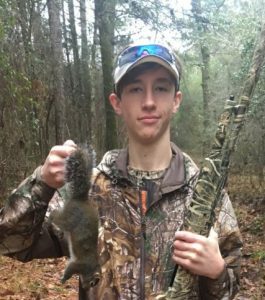 We kicked things off for our 2018 programs this past weekend with our annual squirrel hunt. This was an overnight program at our Bush, LA Camp Facility. We started out by giving a warm welcome to newcomer Justin Aguilar. Afterwards we settled in for some of Lisa Alpha’s good cooking, which the boys, and mentors really enjoyed, as it was her first time preparing the meal for our programs. We then had some great “man time” around the campfire before settling in for the night, as 5:30 AM would come early. Saturday morning sleepy eyed and tired we got up and grabbed a quick bite. There was some uncertainty of squirrel hunting due to the threat of rain, but we did have a backup plan for some indoor basketball, just in case. As we woke in the morning, God, being who He is, held off the rain, and allowed the squirrel hunt to take place. 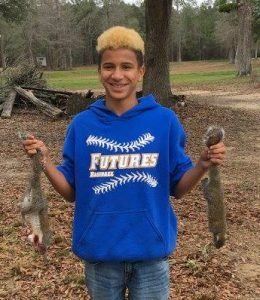 There were 7 squirrels harvested between 3 of the 6 boys who attended,. Riley taking 3, C.J taking 3, one of which was his 1st, and Isaac taking his 1st. After returning back to camp, we cleaned the squirrels, which will be a meal for one our next programs. Afterwards we had lunch, and a devotion, led by Program Director Ronnie Alpha. We learned how a GPS (global positioning system) helps us navigate through the woods, and how God’s GPS (God’s Plan of Salvation) Jesus Christ, helps us navigate through this life, and gives us eternal life. 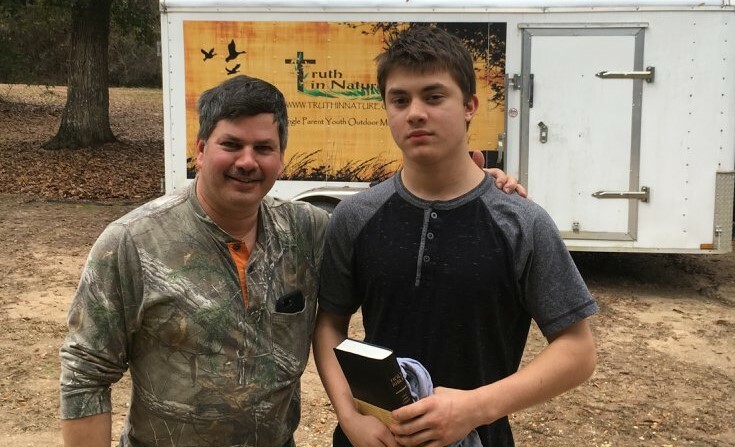 Mentor Daniel Lombardo then closed us out in prayer, and Program Director Ronnie Alpha presented newcomer, Justin Aguilar, with a Truth in Nature T-shirt, and a copy of God’s word. We ask that you continue to pray over the boys, the mentors, the ministry, and for God to be glorified. If you would like to get a young man involved please use the contact information located at the top to contact Program Director Ronnie Alpha. You can view all the pictures using the link below.